A massive clean-up of Bandar Maharani has started in conjunction with the birthday of the Sultan of Johor and the proclamation of Muar as a royal town. Muar district officer Abdul Rahman Muhamed Dewam said the gotong-royong campaign was being carried out in Bandar Maharani and villages for one month. Abdul Rahman said programmes had been drawn up for five days of celebration beginning Nov 21. He said these would include the people having tea with the sultan, a procession of decorated floats and boats, jet ski international challenge in sungai Muar, cultural dances, marathon and fireworks display. Abdul Rahman said a special programme had also been drawn up for the wife of the Sultan of Johor, Raja Zarith Sofiah, to distribute gifts to poor children. 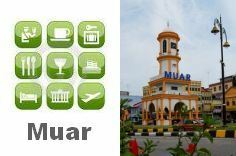 “For the first time, Muar residents will be given the opportunity to witness the jet ski international challenge in sungai Muar. “To date, participants from eight countries, including the United States, Japan, Thailand, Singapore and Malaysia have registered to take part,” he said after launching the campaign in Muar recently. Abdul Rahman said the Sultan Ismail bridge, built 33 years ago, would be closed for the first time on Nov 25 at 5pm to enable the people to witness the sea events, while enjoying teh tarik and mee rebus on the bridge. He called on the people to come out with their families to witness the historic event, adding that all buildings should fly state flags. He said public cooperation was important to keep the town and house compounds clean. Among those present were Chris Lee Ching Yong, special officer appointed by Menteri Besar Datuk Abdul Ghani Othman, Muar police chief Assistant Commissioner Muhammad Nasir Ramli, Muar Chinese Chamber of Commerce and Industry chairman Datuk Sia Beng Chuan and Muar community development officer Tey Tiong Seng. Meanwhile, representatives of the Muar Fire and Rescue Services Department, SWM Environment Sdn Bhd and Muar Municipal Council workers flushed drains and poured Effective Microorganisms (EM) liquid into drains at the Jalan Haji Abu hawker centre during the clean-up campaign.